One moment your team is efficient and effective and the next moment: they’re at a dead stop. You’ve sent them to training, provided them with the right resources, given them a great project, clear goals and everything they need to be successful. And yet it is so easy for a team or a single individual to screech to a halt. One of the most important things a manager can do for his team is to be always anticipating, identifying, avoiding and removing roadblocks. It shouldn’t always be the manager, though. Teaching your employees how to do this themselves would be one of those things more important than doing it yourself. Meet often. You do have regular one-on-one meetings with the people on your team, right? Use this time to keep up to date with your team and understand how “things are going”. Listen. The clues to the next roadblock might be right in front of you. Solicit ideas. Can your employee figure out how to identify, avoid or remove the roadblock? Be accessible. That old adage about “management by walking around” has truth in it. Your employee might not remember to tell you during your one-on-one or perhaps something just cropped up. Walking around, keeping your door open (Do you have a door?) and being accessible are ways to keep up-to-date on roadblocks in the making. Have a wide network of connections. 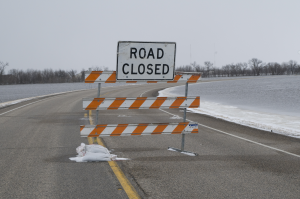 Many times the roadblocks you encounter are put up by someone outside your organization. Having a wide circle of contacts can sometimes help you understand who can be helpful in removing or getting around your roadblock. Know the rules. Sometimes you find the road you’re on isn’t really necessary. Something in your situation might allow you to use a different (shorter? faster? better?) path. Be creative. Can you go over it? Under it? Around it? Here again, knowing the rules (and when to break them) can be important. Hopefully you’re not often called on to perform this service, but it’s something you need to be on the lookout for. And it’s even better if you can teach your people to do it themselves. This entry was posted in Management and tagged management, roadblocks. Bookmark the permalink. I love that this is a very subtle reminder that managers are not problem-preventers, but instead they are problem-anticipaters. Problems will arise. Be prepared. What’s equally important is to EMPOWER your team to respond effectively. We may educate our teams how to anticipate a problem, but if they aren’t prepared or authorized to respond with the appropriate actions, what’s the point? Great article. Thanks for the additional insight. Training and empowering your team to remove the roadblocks. Reminds me of Jim Collins and Jerry Porras in their book Built to Last: Successful Habits of Visionary Companies, specifically their admonition to “be a clock builder, not a time teller” (and more here).